With a passion for helping dogs in need, Bit Spring is proud to have helped Renee’s Rescues with a new website and AdWords campaign. Working with a non-profit organization meant we could apply for Google’s non-profit grant program which provides a free Google Apps account and a huge monthly AdWords budget. After launching the AdWords campaign, we saw daily traffic jump over 200% while targeting visitors most likely to be interested in dog adoption within a 100 mile radius. 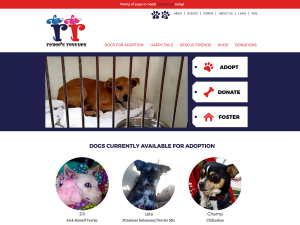 Several custom WordPress plugins were developed specifically for rescue animals. By building the functionality into plugins, we are able to reuse this functionality on future animal rescue websites. Learn more about our web development service and find out how we can help your organization.